Thalapathy 61 aka Vijay 61 brings back the blockbuster combo Vijay and Atlee after their successful outing in "Theri" last year. The movie is produced by Sri Thenandal Films and this project is a very special as it is their milestone 100th film. 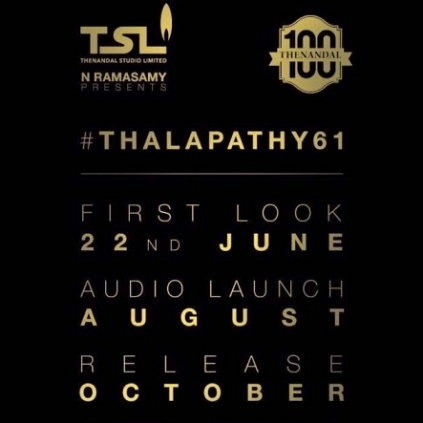 The shooting which began a couple of months ago was initially expected to release next year, but Team Thalapathy 61 has made an unexpected surprise announcement now (April 22nd) through a poster which has a few important details about the project and the release plans. AR Rahman is officially announced as the music director for the first time by the team. The October release window hints that the movie has a high probability to release for Diwali 2017, which ensures a grand opening for a big star movie.